Do you wish to: Support the next generation of informed citizens who are able to ask the critical questions affecting their own lives: questions of their health, nutrition, medicine and of their local environment, of technology and its benefits and drawbacks, and questions of legislators and elected officials drafting the legislation and presenting plans for developments which may affect all our lives? Do you believe: that all high school students need to understand the concepts and the methods of science to foster their analytical thinking and to prepare them to live in an increasingly complex world of science and technology? Do you believe that all responsible citizens should have the critical thinking tools to analyze scientific, medical, technological, economic and even political assertions/claims? Do you want to support the learning of critical thinking and science inquiry for all high school teachers and their students? WHAT WE DO 1. We prepare, together with the Science Education program of SEYS, pre-service high school science teachers to become initially certified in NY State and knowledgeable in the methods of science inquiry and critical thinking and especially encourage women and minority applicants. 2. We organize and host Investigative Science Fairs (ISS/Fair) for Queens high school students. 3. For in-service high school teachers we structure Professional Development Workshops, STC Seminars, and courses, e.g. Physical Science 501  all of these focussed on investigative science and science inquiry teaching methods. science more deeply AND to ensure they acquire the analytical tools needed to approach problems of all kinds (social & economic), not only science problems. Many teachers have had little experience in investigative science, i.e. science inquiry, as described in the National Science Education Standards. It is a comprehensive method of teaching science which encourages the student to investigate a ‘question' into a significant science conceptual area. It requires the students to do research, to work in collaboration with others and to record their procedures, data and their thoughts. 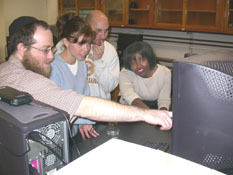 Some participants are undergraduate science majors and many have degrees and have been professionals in a variety of fields: environmental consultant, advertising professional, legal secretary, airport meteorologist, NYC fireman, marine engineer, emergency medical technician, NYC park ranger, nuclear engineer, airline flight attendant, physical therapy assistant, nutritionist, nurse, and more. They come from many countries of the world. RP, A LaGuardia Airport meteorologist works nights until 6 AM and then attends QC to complete science and education courses to become certified as an Earth Science Teacher. He has two children: one and four years old. "It is my firm belief that a person who becomes a teacher later in life will be more tempered and seasoned...and be able to draw on prior professional experience to become a richer science teacher." CF, AAS in Medical Technology, is mother of three daughters, girl scout leader and amateur astronomer, and recently graduated as a certified Earth Science teacher. She took science and education courses one or two at a time and needed seven years to complete her degree. RL, Business Administration/Physical Therapy Program. "It is my hope that my enjoyment for science will be contagious to my students." TB, Political Science/Biology & Culinary Institute of America. "I want to teach science to encourage students to become critical thinkers and investigators, sensitive, aware, careful yet bold....I want to make science approachable and fun." LF, Physical Therapy Asst., is married with two teenage children and taking evening courses. "I believe I have a better understanding today about the adolescent years and wish to use my life experiences & training to encourage and guide my students." © Copyright 2002  2005 by the STC Program. All rights reserved. Disclaimer: The material available through this server reflects the work of many people. Although great care has been taken in preparing the information, Queens College and the City University of New York do not warrant the accuracy, views, opinions or completeness of the information, text, graphics, links and other items contained on this server or any other server.